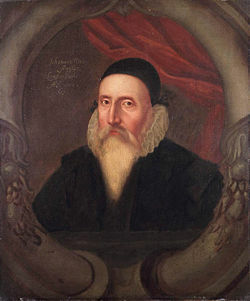 A sixteenth-century portrait of John Dee, artist unknown. According to Charlotte Fell Smith, this portrait was painted when Dee was 67. It belonged to his grandson Rowland Dee and later to Elias Ashmole, who left it to Oxford University. John Dee (July 13, 1527–1609) was a noted Welsh mathematician, geographer, occultist, astronomer, and astrologer, whose expertise in these interrelated fields led him to become a personal consultant to Queen Elizabeth I. Due to his interest in magic and the occult, he also devoted much of his life to alchemy, divination, and Hermetic philosophy. Dee straddled the worlds of science and magic just as the two disciplines were becoming distinguishable. One of the most learned men of his age, he began his prolific academic career early, lecturing to crowded halls at the University of Paris while still in his twenties. As an natural philosopher, John was an ardent promoter of mathematics, leading to the popularization of geometry as a discipline and to an increased level of respect for mathematics among the general populace. Likewise, he was also a renowned astronomer and a leading expert in navigation, leading to his theoretical and practical involvement in instructing and training many of the British sailors who would take part in England's voyages of discovery. In this capacity, his writings are the first recorded use of the the term "British Empire." At the same time, he immersed himself deeply into the study of various occult disciplines, including alchemy, magic and Hermetic philosophy. His fascination with such practices, most notably his interest in communing with angels (for the purpose of delving into the mystical fountainhead of creation), was so intense that he devoted the last third of his life almost exclusively to these pursuits. For Dee, as with many of his contemporaries, these activities were not contradictory, but instead were particular aspects of a consistent world-view. Indeed, his fascination with the occult creates a notable parallel with his famed (spiritual) successor, Sir Isaac Newton, a noted scientist whose interest in alchemy caused a biographer to opine: "Newton was not the first of the age of reason: he was the last of the magicians." In 1527, John Dee was born in Tower Ward, London, to a Welsh family, whose surname derived from the Welsh du ("black"). His father Roland was a mercer (an importer and trader of fine cloth) and a minor courtier. Due to his relatively privileged upbringing, young John was free to be educated, first attending the Chelmsford Catholic School and later (1542–1548) St. John's College, Cambridge, where he was awarded with both a bachelor's and a master's degree. His prodigious abilities as a natural philosopher were recognized during his studies, and he was made a founding fellow of Trinity College. In the late 1540s and early 1550s, he supplemented his education by traveling to Europe, where he studied at Leuven and Brussels, apprenticed himself to Gemma Frisius (a famed Dutch mathematician, cartographer and instrument maker), and became a close friend of the cartographer Gerardus Mercator. From these valuable acquaintanceships, he received both tutelage and state-of-the-art technology, returning to England with an important collection of mathematical and astronomical instruments. Even at this early stage, Dee's interests as a natural philosopher transcended what today would be called "science." As one example, we can turn to his 1552 meeting with Gerolamo Cardano in London: during the latter's sojourn in England, the duo investigated astrology, perpetual motion machines, and also did some experiments upon a gem purported to have magical properties. Likewise, his interest in alchemy (as evidenced in diary entries ennumerating his reading lists) was also well established by this point. Dee was offered a readership in mathematics at Oxford in 1554, which he declined; he was already occupied with writing and was perhaps hoping for a better position in the royal court. Such an opportunity arose in 1555, when Dee became a member of the Worshipful Company of Mercers, as his father had, through the company's system of patrimony. Unfortunately, this period also saw the first of his run-ins with secular and religious authorities. Specifically, that same year (1555), he was arrested and charged with "calculating" for having cast (presumably inauspicious) horoscopes for Queen Mary and Princess Elizabeth; more distressing still, these charges were then expanded to treason against Mary. In response, Dee appeared before the high court at the Palace of Westminster's Star Chamber and exonerated himself from the charge of treason. However, it was still suggested that his theories and practices bordered on witchcraft, so he was turned over to the reactionary Catholic Bishop Bonner for a religious inquiry. Eventually, the young scholar cleared his name yet again, and soon became a close associate of Bonner. In both cases, Dee's potent lifelong penchant for secrecy likely worsened matters and left his open to such critiques. Indeed, these two episodes were only the most dramatic in a series of attacks and slanders that dogged Dee throughout his life. Dee uses powerful arguments to enforce his plea, choosing such as would make the most direct appeal to both Queen and people. She will build for herself a lasting name and monument; they will be able all in common to enjoy what is now only the privilege of a few scholars, and even these have to depend on the goodwill of private owners. He proposes first that a commission shall be appointed to inquire what valuable manuscripts exist; that those reported on shall be borrowed (on demand), a fair copy made, and if the owner will not relinquish it, the original be returned. Secondly, he points out that the commission should get to work at once, lest some owners, hearing of it, should hide away or convey away their treasures, and so, he pithily adds, "prove by a certain token that they are not sincere lovers of good learning because they will not share them with others." Despite (or perhaps because of) the revolutionary nature of his suggestions, his proposal was not taken up. Instead, he found it necessary to expand his personal library at his home in Mortlake, tirelessly acquiring books and manuscripts from England and the European Continent. Dee's library, a notable hub of learning and scholarship outside the university system, became the greatest in England and attracted many scholars. When Elizabeth I took the throne in 1558, Dee became her trusted advisor on astrological and scientific matters. His esteem in the royal court was such that he was specifically assigned the task of choosing an astrologically propitious date for the young queen's coronation . Based on his perceived success in this venture, he was retained in the crown's service for the next two decades. In 1564, Dee wrote the Hermetic text Monas Hieroglyphica ("The Hieroglyphic Monad"), an exhaustive mystical work that brought together particular strands of the philosopher's research interests. Particularly, it presented a theory unifying alchemy, Pythagorean numerology, textual Qabalah, and pious mysticism, with the primary thesis that all creation possesses a fundamental unity. This thesis was symbolically represented by the glyph pictured to right. This work was highly valued by many of Dee's contemporaries, but the loss of the secret oral tradition of Dee's milieu makes it difficult to interpret today. He also published a "Mathematical Preface" to Henry Billingsley's English translation of Euclid's Elements in 1570, arguing for the central importance of mathematics and outlining the influence of mathematical reasoning on the other arts and sciences. Intended for a general, non-academic audience, it proved to be Dee's most widely influential and frequently reprinted work. Most significantly, Dee's aptitude for cartography and astronomy caused him to be appointed as an adviser to England's voyages of discovery, a capacity that he served in from the 1550s through the 1570s. In this role, he provided both technical assistance in navigation and ideological backing in the creation of a "British Empire" (a term that he coined). Pursuant to this experience, in 1577 Dee published General and Rare Memorials pertayning to the Perfect Arte of Navigation, a visionary work that set out his vision of a British maritime empire and asserted England's territorial claims on the New World. In his courtly service, John Dee came to be acquainted with many luminaries of the day, including Humphrey Gilbert and Sir Philip Sidney. By the early 1580s, Dee was growing dissatisfied with his progress in learning the secrets of nature and with his own lack of influence and recognition. He began to turn towards the supernatural as a means of acquiring mystical knowledge. 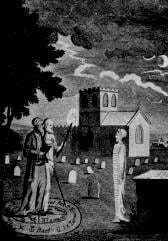 His primary method of achieving these revelations was through the intercession of a "scryer" or crystal-gazer, who would act as an intermediary between Dee and angelic beings. Though the philosopher's initial attempts at such contact were not satisfactory, in 1582, he met Edward Kelle] (then going under the name of Edward Talbot), who impressed him greatly with his preternatural abilities. Dee took Kelley into his service and began to devote all his energies to his supernatural pursuits. These "spiritual conferences" or "actions" were conducted with an air of intense Christian piety, always after periods of purification, prayer and fasting. Further, Dee's interests in this period were largely philanthropic, as he believed that such supernatural contacts (and the mystical enlightenment that they could bring) would be ultimately beneficial to humankind. Conversely, the character of Kelley is harder to assess, though his posthumous reputation seems to suggest the he was charlatan. Dee and Kelley were well versed in practical Cabala and experimented with the angel magic of the Renaissance magician, Henry Cornelius Agrippa. Agrippa had elaborated a system of numerical and alphabetical tables for the summoning of angels, and it was within this framework that the two Elizabethans worked. Dee used Kelley's gifts as an expert scryer, one who could "travel" in the many realms of spirit existence, to vicariously enter into conversation with the angels in order to tempt from them the secrets of the universe. During their lengthy séances, Kelley would "scry in the spirit vision" using a shew-stone in much the same way as a seer might use a crystal ball. Dee asked his questions through Kelley and duly recorded the results. In this way, Dee slowly built up an entire cosmology of angels and demons, and sketched out thirty Aethyrs (or Aires)—realms of otherworldly existence. In 1583, Dee met the visiting Polish nobleman Albert Łaski, who invited Dee to accompany him on his return to Poland. After consulting with the angels (through Kelley), Dee was persuaded to embark on the voyage. Dee, Kelley, and their families left for the Continent in September 1583, but Łaski proved to be bankrupt and out of favor in his own country. As a result, Dee and Kelley found it necessary to begin a nomadic life in Central Europe, though they did not allow this to impede their spiritual conferences, which Dee continued to record meticulously. In his itinerancy, the natural philosopher had audiences with Emperor Rudolf II and King Stephen of Poland where he tried to convince them of the importance of angelic communications in comprehending the true natures of mortal existence and of the Christian eschaton. Perhaps due to his ethical critiques of their policies, he was not accepted into the court of either monarch. In 1587, during a spiritual conference in Bohemia, Kelley told Dee that the angel Uriel had ordered that the two men should share all of their possessions, including their wives. Modern scholars have imputed that this distasteful order could have been invented by Kelley, who by that time was becoming a prominent alchemist and was much more sought-after than Dee, as a means of ending the spiritual conferences (and his relationship with the older man). Due to Dee's faith in these messages, he accepted this order (albeit with great personal anguish) and heeded the angel's request. However, it seems that this arrangement caused him considerable personal discomfort, as soon after he broke off the conferences and did not see Kelley again. After this falling out, Dee returned to England in 1589. Dee returned to Mortlake after six years to find his library ruined and many of his prized books and instruments stolen. He sought support from Elizabeth, who honored her former adviser by making him Warden of Christ's College, Manchester, in 1592. Early in his tenure, he was consulted concerning the demonic possession of seven children, but took little interest in the matter, although he did allow those involved to consult his still extensive library. However, his experience at this institution was suboptimal, as he found that could not exert much control over the Fellows, who disrespected (and even despised) him—perhaps due to his affiliation with Kelley. He left Manchester in 1605 to return to London, though by this time Elizabeth was dead, and James I, unsympathetic to anything related to the supernatural, provided no assistance to the aged scholar. Dee spent his final years in poverty at Mortlake, forced to sell off various possessions to support himself and his daughter, Katherine, who cared for him until the end of his life. John Dee died at age 82 in Mortlake, sometime in late 1608 or early 1609. The uncertainty in dating arises due to the fact that both the parish registers for his community and Dee's gravestone are missing. Dee was married twice and had eight children. Details of his first marriage are sparse, but is likely to have been from 1565 to his wife's death (ca. 1576). Such uncertainties are mitigated for the period from 1577 to 1601, when Dee kept a meticulous diary. As such, it can be said with certainty that in 1578 he married the 23-year-old Jane Fromond (Dee was 51 at the time). Jane died during the plague in Manchester in 1605, along with a number of his children, including his son Theodore. The fates of his daughters Madinia, Frances and Margaret are uncertain, as Dee had by this time ceased keeping his diary. His eldest son, Arthur, followed in his father's footsteps, becoming a scholar, alchemist, and hermetic author, employed by the royal families in both Russia (under Michael the First) and England (Charles the First). The Monas Hieroglyphica was a daring and inventive proposal for a symbolic language that had the power to reveal the divine plan of creation, to explain the workings of the material world in the principles of alchemy, and to assist the mystic ascent of the soul. In the alchemical dimension of the Monas Hieroglyphica, Dee participated in an important new direction taken by alchemy in the Renaissance, and provided one foundation for the spiritual idea of alchemy. From the first recorded angel conversation, the angels told Dee that the events of the Apocalypse were already afflicting the earth. As the conversations developed, however, the angels were morea ttentive to Dee's role in the unfolding events -a role dependent upon his mastery of a restored natural philosophy and a perfected alchemy conveyed to him by the angels. In addition to his achievements as an occultist and a mystic, Dee also made many important contributions to the natural sciences. He promoted the sciences of navigation and cartography, most notably through his studies alongside Gerardus Mercator, and through his important collection of maps, globes and astronomical instruments. From these experiences, he developed new instruments as well as special navigational techniques for use in polar regions. More practically still, Dee served as an adviser to the English voyages of discovery, and personally selected promising sailors and trained them in navigation. As well as being an astrological, scientific and geographical advisor to Elizabeth and her court, he was also an early advocate of the colonization of North America and a visionary of a British Empire stretching across the North Atlantic. John Dee believed that mathematics (which he understood mystically) was central to the progress of human learning. His promotion of the mathematical sciences outside the universities was an enduring practical achievement. Most significantly, his "Mathematical Preface" to Euclid was meant to promote the study and application of mathematics by those without a university education, and was very popular and influential among the "mecanicians": the new and growing class of technical craftsmen and artisans. Dee's preface included demonstrations of mathematical principles that readers could perform themselves. The centrality of mathematics to Dee's vision makes him (by some measures) more modern than Francis Bacon, though some scholars believe Bacon purposely downplayed mathematics in the anti-occult atmosphere of the reign of James I. It should be noted, however, that Dee's understanding of the role and function of mathematics is radically different than our contemporary view (as discussed above). Ten years after Dee's death, the antiquarian Robert Cotton purchased land around Dee's house and began digging in search of papers and artifacts. He discovered several manuscripts, mainly records of Dee's angelic communications. Cotton's son gave these manuscripts to the scholar Méric Casaubon, who published them in 1659, together with a long introduction critical of their author, as A True and Faithful Relation of What passed for many Yeers between Dr. John Dee (A Mathematician of Great Fame in Q. Eliz. and King James their Reignes) and some spirits. As the first public revelation of Dee's spiritual conferences, the book was extremely popular and sold quickly. Casaubon, who believed in the reality of spirits, argued in his introduction that Dee was acting as the unwitting tool of evil spirits when he believed he was communicating with angels. This book is largely responsible for the image, prevalent for the following two and a half centuries, of Dee as a dupe and deluded fanatic. Around the same time the True and Faithful Relation was published, members of the Rosicrucian movement claimed Dee as one of their number. There is doubt, however, that an organized Rosicrucian movement existed during Dee's lifetime, and no evidence that he ever belonged to any secret fraternity. However, Dee's reputation as a magician and the vivid story of his association with Edward Kelley have made him a seemingly irresistible figure to fabulists, writers of horror stories and latter-day magicians. The accretion of false and often fanciful information about Dee often obscures the facts of his life, remarkable as they are in themselves. A re-evaluation of Dee's character and significance came in the 20th century, largely as a result of the work of the historian Frances Yates, who brought a new focus on the role of magic in the Renaissance and the development of modern science. As a result of this re-evaluation, Dee is now viewed as a serious scholar and appreciated as one of the most learned men of his day. His personal library at Mortlake was the largest in the country, and was considered one of the finest in Europe. Dee's Speculum or Mirror (an obsidian, Aztec cult object in the shape of a hand-mirror, brought to Europe in the late 1520s), which was once owned by Horace Walpole, 4th Earl of Orford. The large, elaborately-decorated wax "Seal of God," used to support the "shew-stone," the crystal ball used for scrying. In December 2004, both a shew stone formerly belonging to Dee and a mid-1600s explanation of its use written by Nicholas Culpeper were stolen from the Science Museum in London; they were recovered shortly afterwards. ↑ Nicholas H. Cluelee, "The Monas Hieroglyphica and the Alchemical Thread of John Dee’s Career," Ambix 52 (3) (November 2005): 197–215. 198. ↑ 4.0 4.1 4.2 4.3 4.4 4.5 4.6 4.7 4.8 4.9 Fell Smith, Charlotte (1909). John Dee: 1527–1608. London: Constable and Company. ↑ 6.0 6.1 (1792)Mortlake. The Environs of London: County of Surrey 1: 364-88. ↑ Fell-Smith, Chapter II, accessed at johndee.org. Retrieved July 12, 2007. ↑ 16.0 16.1 16.2 16.3 Calder, I.R.F. (1952). John Dee Studied as an English Neo-Platonist. University of London. Retrieved 26 October, 2006. ↑ Alex Owen, "The Sorcerer and His Apprentice: Aleister Crowley and the Magical Exploration of Edwardian Subjectivity," The Journal of British Studies 36 (1) (Jan. 1997): 99-133. 105. ↑ 20.0 20.1 20.2 20.3 20.4 Mackay, Charles (1852). "4", Memoirs of Extraordinary Popular Delusions and the Madness of Crowds. London: Office of the National Illustrated Library. ↑ History of the Alchemy Guild. International Alchemy Guild. Retrieved 26 October, 2006. ↑ "John Dee". Encyclopædia Britannica (11th Ed.). (1911). London: Cambridge University Press. ↑ Nicholas H. Clulee, "The Monas Hieroglyphica and the Alchemical Thread of John Dee's Career," Ambix 52(3) (2005): 197-215. 202; Nicholas H. Clulee, "Astrology, Magic, and Optics: Facets of John Dee's Early Natural Philosophy," Renaissance Quarterly 30 (4) Studies in the Renaissance Issue. (Winter, 1977): 632-680. passim. ↑ Deborah E. Harkenss, "Shows in the Showstone: A Theater of Alchemy and Apocalypse in the Angel Conversations of John Dee (1527-1608/9)," Renaissance Quarterly 49 (4) (Winter, 1996): 707-737. 711. ↑ Ron Heisler, "John Dee and the Secret Societies." Hermetic Journal (1992) the alchemy website.Retrieved April 7, 2008. ↑ BSHM Gazetteer—LONDON: British Museum, British Library and Science Museum. British Society for the History of Mathematics (2002-08). Retrieved 27 October, 2006. ↑ Adam Fresco (2004-12-11). Museum thief spirits away old crystal ball. The Times. Retrieved 27 October, 2006. Clulee, Nicholas H. "Astrology, Magic, and Optics: Facets of John Dee's Early Natural Philosophy." Renaissance Quarterly 30 (4) Studies in the Renaissance Issue. (Winter, 1977): 632-680. Clulee, Nicholas H. "The Monas Hieroglyphica and the Alchemical Thread of John Dee's Career." Ambix 52 (3)(2005): 197-215. Dee, John. Quinti Libri Mysteriorum. British Library, MS Sloane Collection 3188. Also available in a fair copy by Elias Ashmole, MS Sloane 3677. Dee, John. John Dee's five books of mystery: original sourcebook of Enochian magic. from the collected works known as Mysteriorum libri quinque, edited by Joseph H. Peterson, Boston: Weiser Books ISBN 1578631785. Fell Smith, Charlotte. John Dee: 1527–1608. London: Constable and Company, 1909. Available online. Retrieved April 7, 2008. French, Peter J. John Dee: The World of an Elizabethan Magus. London: Routledge & Kegan Paul, 1972. Harkenss, Deborah E. "Shows in the Showstone: A Theater of Alchemy and Apocalypse in the Angel Conversations of John Dee (1527-1608/9)." Renaissance Quarterly 49 (4)(Winter, 1996): 707-737. 711. Keynes, John Maynard (1972). "Newton, The Man." The Collected Writings of John Maynard Keynes, Volume X.
Szönyi, György E. (2004). "John Dee and Early Modern Occult Philosophy." Literature Compass 1 (1): 1–12. Woolley, Benjamin. The Queen's Conjuror: The Science and Magic of Dr. John Dee, Adviser to Queen Elizabeth I. New York: Henry Holt and Company, 2001. Yates, Frances A. Theatre of the World. London: Routledge, 1987. Azogue: Section of the e-journal Azogue with original reproductions of Dee texts. The J.W. Hamilton-Jones translation of Monas Hieroglyphica from Twilit Grotto: Archives of Western Esoterica. The Private Diary of Dr. John Dee And the Catalog of His Library of Manuscripts at Project Gutenberg. This page was last modified on 15 May 2018, at 19:39.